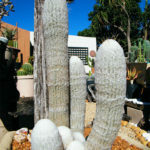 Espostoa lanata is a columnar, densely hairy cactus, covered by a warm, woolly coat and well adapted to high altitudes. 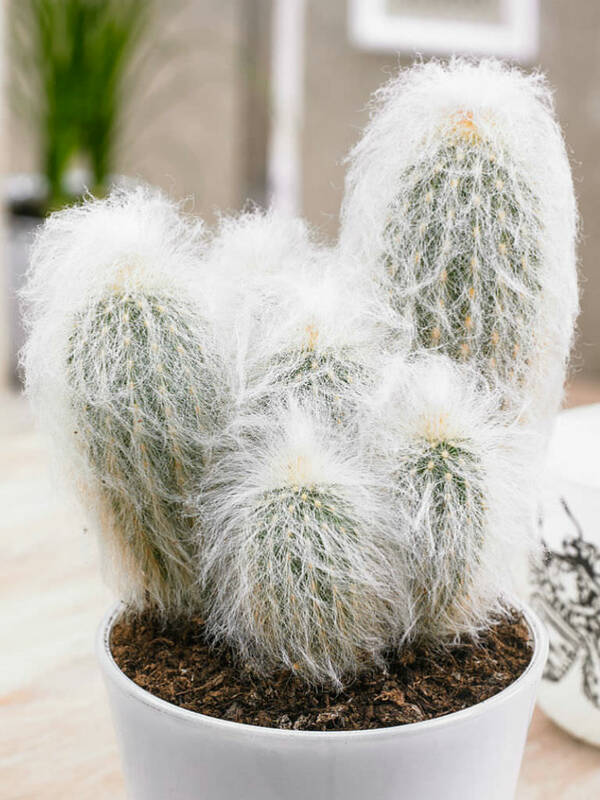 It looks like Cephalocereus senilis. 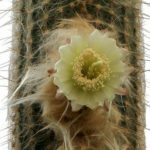 The main difference is the presence of sharp spines on E. lanata. It is wide spread in its habitat and quite variable in size and spines and for this reason it has received several names. 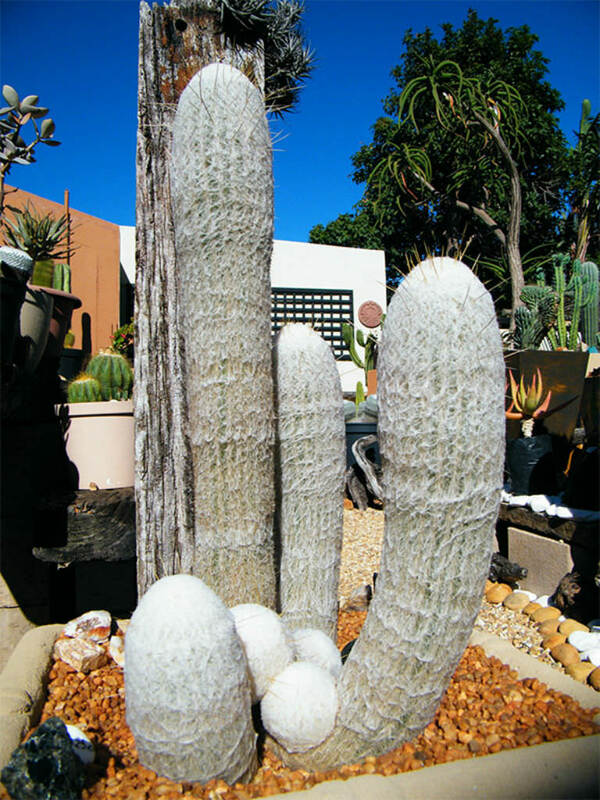 It is up to 8 inches in diameter and up to 23 feet (7 m) tall. There are 18 to 25 ribs. The ribs and the sharp are mainly hidden by tissue woolly. It branches only after several years. 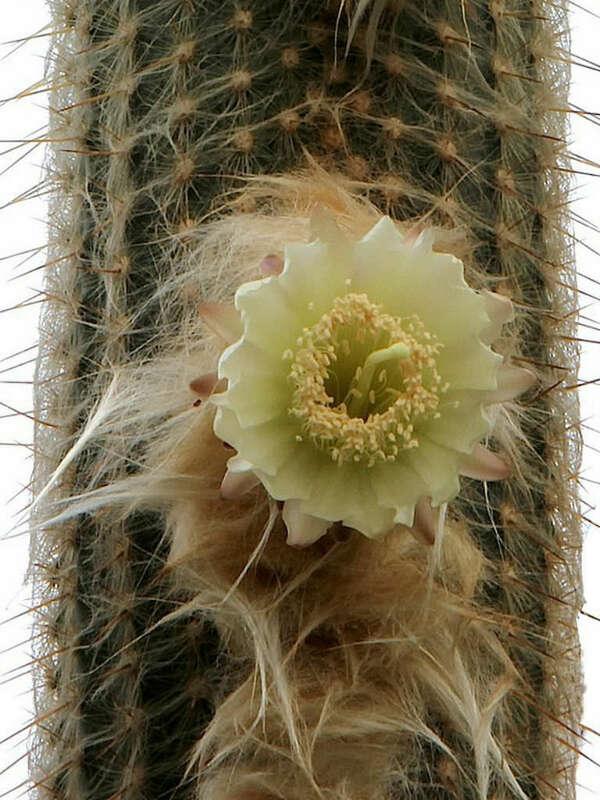 It flowers at night from a lateral cephalium after several years. It has nocturnal flowers, up to 2 inches (5 cm) in diameter, white to purple and appear in late spring to early summer. 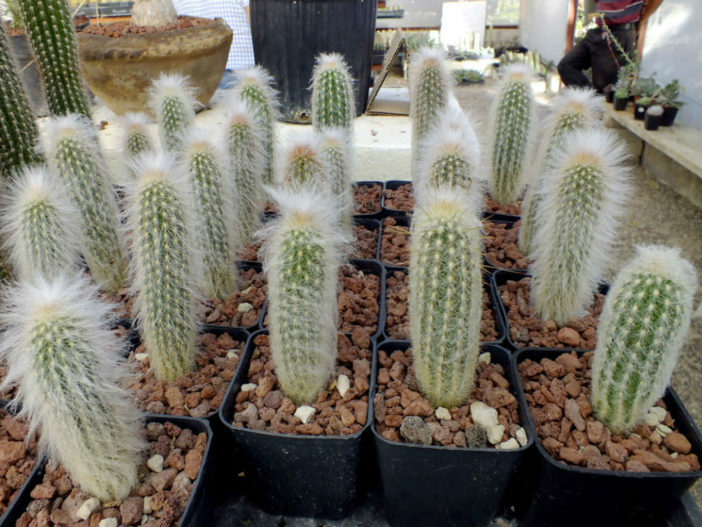 Several species of Espostoa, are especially popular in cultivation due to their fuzzy white hairy appearance. 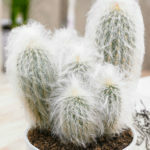 The plants are typically sold by large commercial growers as up to 12 inch (30 cm) stems. However, being large columnar species, these plants do not grow nearly as vigorously in pots as they would in the ground. Plants tend to quickly fill the pots becoming pot bound and then growth slows to a crawl. As such, these plants rarely, if ever reach maturity meaning they don’t produce the cephalium and subsequently do not flower. On the other hand, those in warmer climates that can plant the species directly in the ground may indeed have plants that form a nice grouping of stems that will eventually flower. Its original habitat is from southern Ecuador to the northern Peru on the west slopes of the Andes mountains.